Researching immigration, onomastics and language-as-power. In February, two high profile and amusing name mistakes occurred, and they still have me thinking about how these situations differ from the name challenges experienced by people who have immigrated—a phenomenon which is the focus of my dissertation. We’ll get to those thoughts in a few paragraphs. First, the name mistakes! Academics who attend the annual national Congress of the Humanities and Social Sciences, once known as “The Learneds”, received letters inviting us to register for the 2014 conference. But on nearly all of the envelopes, our surnames were misspelled! Though I often experience minor misspellings of my last name, this misnomer had a strange anglicizing effect. And coming from a professional organization through which I network, it was especially disconcerting: how my name exists at Congress is important to me. These mispellings had similarities. Generally, the first two or three letters of each surname was correct, and then our names nosedived away from reality. In my case, my name was altered from Diane Dechief to Diane Decker. Yes, Zoë’s Constantinides became , “Zoë Consulate General of Sweden”. OF SWEDEN! Bruno Cornellier’s envelope was addressed to Bruno Corona. Nathan Rambukkana was turned into Nathan Ramdas. Beatriz Bartolomé Herrera became Beatriz Barton. Peter Lester shifted to Peter Letocha. Kat Sark’s name addition made her surname match mine: Kat Sarker. And Dr. Owen Livermore became Dr. Livingstone. So, as Vice-President of the Canadian Society for the Study of Names, I took it upon myself to write a letter to the Congress organizers. I told them about Zoë’s name change, just to break the ice, and then I asked directly if spell check was to blame. I did not, however, float the drunk database theory. I received a couple of very apologetic responses that were quite similar to the official apology that arrived (by email, not post) a couple of days later: spell check was not to blame, but a more generic “technical issue” was. The mail-out happened at the same mailing house that Congress usually works with. And fear not: Congress definitely still has our real names in their databases. Later in February, the Academy Awards took place. And a highlight was this gaff: While introducing performer Idina Menzel, John Travolta, seeming more nervous than drunk, mistakenly called her Adele Dazeem. 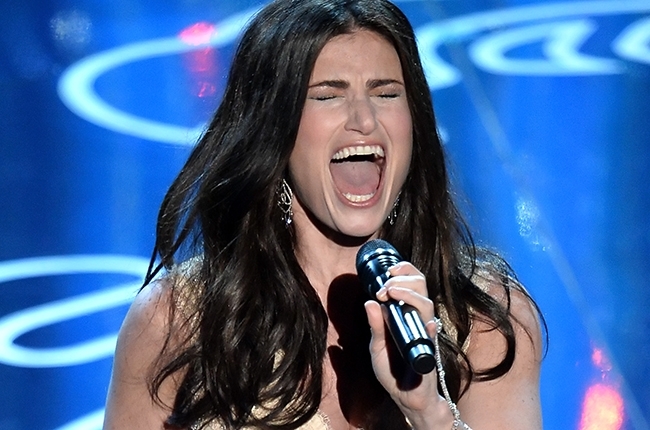 Idina Menzel was about to perform at the Oscars! And John Travolta had gone to rehearsals in preparation for that introduction! 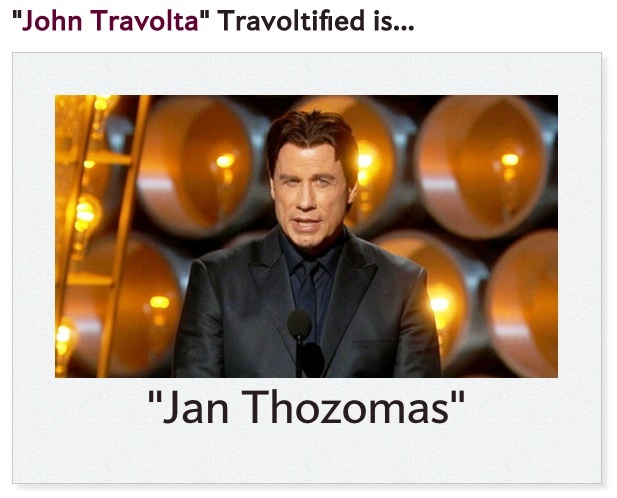 Travolta’s name mistake was quickly noted and was responded to creatively: a widget made the rounds of social networks, “Travoltifying” names left and right. On Facebook at least, people seemed charmed and amused by having their names Travoltrified. I admit to using the widget myself– for the sake of name science. So why are these name errors funny, in contrast to the name mistakes experienced by people who have immigrated? 1. Exceptional cases: if people usually get your name right, and then this one time it’s wrong, that’s funny. In contrast to the situation for people who have immigrated and have their names miswritten and mispronounced constantly, an occasional misnomer is worth a chuckle. But it’s also funny that the Congress participants whose names are most common STILL didn’t have their names flubbed. 2. How they got it wrong: The misnomers created by both Congress and John Travolta were really very different than the original names. It bears repeating. Zoë Constantinides became Zoë Consulate General of Sweden!!! That said, many people I interviewed for my dissertation were shocked by the ways that their names have been changed. In one case, a participant from Colombia who originally used four names (two first and two last) had one of his last names truncated on his Permanent Resident Card, and his newly formed last name appeared to be Dutch. 3. The people who made these two name mistakes felt really sorry and apologized profusely. John Travolta was apparently “beating himself up all day” for the mistake he made in front of 43 million viewers. And Jean-Marc Mangin, Executive Director of the Federation for the Humanities and Social Sciences, personally apologized “for this mistake and any inconvenience it has caused”. In many of the cases described by the participants, people rarely even realize that they’ve made a mistake with the participants’ names. Apologies are rarely anticipated or received. 4. We were all in it together. In these two name situations, we weren’t individually having our name messed up and feeling like no one else could understand. Except, potentially, for Idina Menzel. But then, thousands of people wanted to have their names transformed as Idina Menzel’s was; maybe that provided her some solace. One notable thing about the Congress misnomers is that people with the most common names, who didn’t have their names altered, may have actually felt a little left out of the hilarity. Name errors and embarrassment about making them come down to this: if we know and care about someone, we get her name right. To mispronounce or misspell someone’s name demonstrates either a lack of care or an ignorance of how their name should be. The name mispronunciations that people who have immigrated so often experience can be diminished with effort and care that is enacted socially, professionally, and bureaucratically. When someone is important, we usually get their names right. Isn’t that so, Congress and Jan Thozomas? Haha. Thanks so much, Blarg! I’m so amused by this piece, Diane! Finally checking out your blog! Nice to see you here, Maryann! Thanks for reading. More posts coming this fall.